Fargoth, a Bosmer commoner living in Seyda Neen, will likely be the first person you meet after getting out of the Census and Excise Office. It seems he has misplaced his magic ring. You are required to take this ring from a barrel before leaving the Census and Excise Office. You can choose to give it to him or keep it for yourself. Giving it to him will earn you his undying gratitude, as well as a good word given to his friend Arrille, which will get you much better prices at Arrille's Tradehouse. You do get a chance to get the ring back as well as some gold, so this is probably the best tactic. It is easy, however, to bypass him and the other residents of Seyda Neen when following the advice of your orders or the text that suggests you investigate Arrille's Tradehouse. He also seems to be on bad terms with the guards, who apparently have a weekly 'Let's shake down Fargoth' ritual. While Fargoth has a house in town, he never visits it. No corresponding key exists, though the door is locked. Inside, you can find a stash of alcohol in a cupboard, which you can sell for a reasonable amount of gold. If the Entertainers official plugin is installed, a copy of I'm My Own Grandpa can also be found. 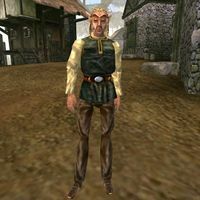 Fargoth is wearing a common shirt with matching pants, shoes, and ring. He is also carrying a torch, a jug, and a small amount of leveled gold. Aside from his natural resistance to disease, and the ability to command animals, he knows no spells. Fargoth's Ring: Return a missing ring and win favor with the owner and his friends. Fargoth's Hiding Place: Find out where Fargoth is hiding his money. "What? What is it? Are you following me? Leave me alone!" "What do you want? Don't bother trying to rob me. The Imperials have taken everything anyway." Bitter Coast region: "The Bitter Coast is named for the salt marshes along the coast northwest of town. From here to the Odai River, it's rugged coastal hills, then it's roadless, uninhabited swamp all the way north to the West Gash and the Sea of Ghosts. Hla Oad is a fishing settlement north of the Odai, and the fishing village of Gnaar Mok is even farther, and both places are small, isolated, and poor. Hunting is fair, and some folks gather mushrooms, pods, and flowers for alchemists." "Hiding place? I don't know what you're talking about! Leave me alone." "I don't have a hiding place. At least not anymore...."
Uhhh. No, sorry. No ring. "Darn. Well if you see it let me know. It's an Engraved Ring of Healing. I know it's in there somewhere." Yes, I found it! Here take it. [Disposition -5] "That's not it! Don't mess with me, I don't like that, if you really find it, let me know." [Disposition +50; Engraved Ring of Healing has been removed from your inventory.] "You found it! Amazing! Thank you, thank you! You are now my favourite friend. I'll be sure to tell the others, especially my friend Arrille who runs the tradehouse here. Go see him, he'll be happy to see you now!" "Yes, thank you for finding it! Those guards better look out." According to the Tax Record, he owes the Seyda Neen Census and Excise Office 111 drakes in taxes, despite owning an actual house instead of a shack. This page was last modified on 19 October 2018, at 23:15.